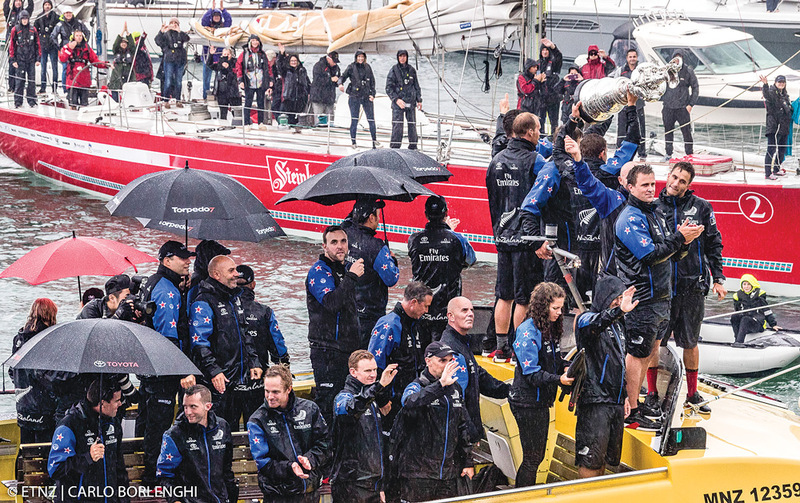 Helmsman Peter Burling holds the Cup. It was sweet revenge for Emirates Team New Zealand that blew a seemingly insurmountable lead in San Francisco, losing eight consecutive races against Oracle Team USA in the last America’s Cup in 2013. This time, the Kiwi team out-engineered, out-designed and out-pedaled Oracle to take the Cup in Bermuda, winning seven races to one. 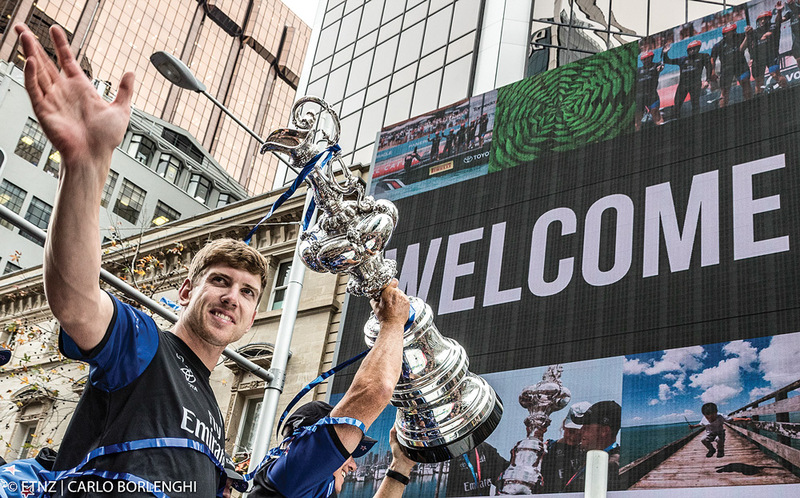 As Helmsman Peter Burling foiled over the finish line, clinching the victory in the final race, Royal New Zealand Yacht Squadron Comm. Steve Mair was huddled belowdecks aboard the superyacht Imagine, owned by Matteo di Nora, the principal investor behind the Kiwi team. According to a story by Suzanne McFadden written for the online Newsroom, with him was Agostino Randazzo, the president of Cicolo della Vela Sicilia, the Italian yacht club behind Patrizio Bertelli’s Italian Luna Rossa team that had been working closely with the Kiwis. Having instructed the club back in New Zealand to turn off the computers and phones and not to accept any packages, Mair ensured that the Italians would be the first challenge received, making them Challenger of Record. The Auld Mug is now ensconced behind alarmed, bulletproof glass in the RNZYS, and it has become a scramble to find a home for the America’s Cup village, where team bases will be built alongside entertainment and media center facilities. The government is working with groups such as “Stop Stealing Our Harbour” that oppose more pier construction along Auckland’s waterfront. Even Steinlager came out to welcome the Cup home to Auckland after a 17-year absence.